William Boeing above and right in 1919 - having just completed the first international mail flight from Vancouver, B.C. to Seattle. Perhaps the greatest visionary among the pioneers of the aviation industry, William Edward Boeing foresaw a national air transportation system a full decade before any of his contemporaries--and promptly set about creating it. In 1903, Boeing left Yale University for the Pacific Northwest to make his mark in the timber business. Emerging from the woods in 1908 with his fortune intact, he became smitten by the new science of aviation. By 1916, William Boeing had founded his own company and had begun manufacturing seaplanes for the U.S. military. Following the aviation industry's collapse at the end of the First World War, Boeing kept his employees busy building furniture and speed boats. His perseverance paid off. By the late 1920s, Boeing was carrying thirty percent of the nation's airmail and the majority of U.S. airline passengers across the western United States. The company was no longer simply building planes. William Boeing was now running a thriving air transport service and maintaining a fleet of airplanes--along with a school for pilots and maintenance crews. Il 15 luglio 1916, William Boeing e George Conrad Westervelt fondano insieme la Pacific Aero Products. Nel 1917, la compagnia prende il nome Boeing. Donald Douglas above and left in the 1950's standing with the DC-7, the last of the great propeller-driven airliners in the Douglas fleet. In 1908, at the age of sixteen, Donald Douglas witnessed the Wright Brothers' famous U.S. Army Signal Corps demonstration at Fort Myer, Virginia--an event that shaped his life. In the following year, as a midshipman at the U.S. Naval Academy, Douglas began building model planes and testing them secretly in the Academy armory. By 1912, he had transferred to M.I.T., becoming the country's first graduate student in aeronautical engineering. In 1915, he accepted the position of Chief Engineer at one of America's foremost aviation companies. By 1917, Donald Douglas had been appointed to direct America's aviation manufacturing effort in World War I. He was twenty-five years old. 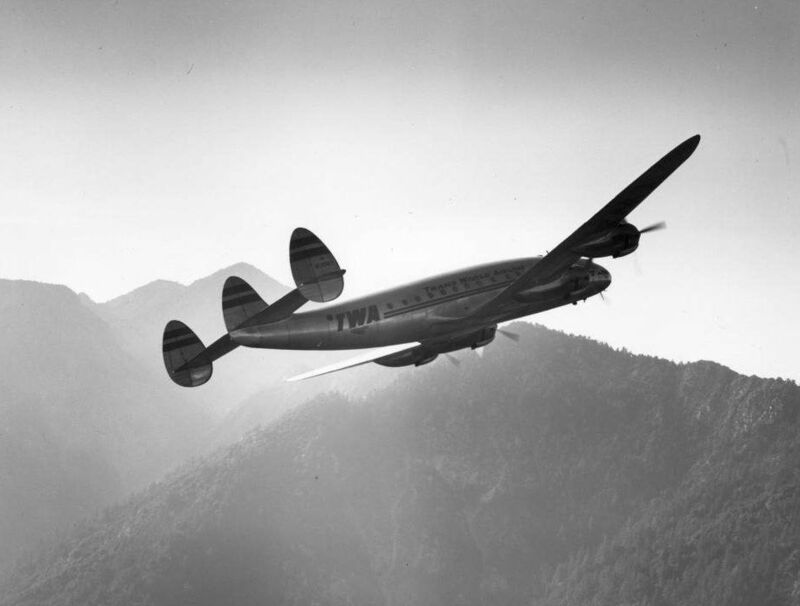 Moving to Los Angeles in 1920, Donald Douglas founded the Douglas Aircraft Company. In 1924, U.S. Army aviators electrified the world as they piloted four Douglas World Cruisers in the first "Around-the-World-Flight." In the 1930s, Douglas produced the legendary DC-3, the most popular commercial airliner of the 20th Century. In the 1940s, as the recognized leader of American aviation manufacturers, Douglas organized a coalition of American plane builders--whose extraordinary production of warplanes ultimately gave the Allies air supremacy in World War II. In the 1950s, Douglas's DC-8 battled head-to-head with the Boeing 707 for leadership as the world's premier commercial jetliner. And in the 1960s, it was Douglas engineers who built the upper-stage of the massive Saturn V rocket that carried the Apollo astronauts to the Moon. United Airlines released this promotional photo of one of its Douglas DC-3s, circa 1937. "First flown in 1935, the Douglas DC-3 became the most successful airliner in the formative years of air transportation, and was the first to fly profitably without government subsidy. 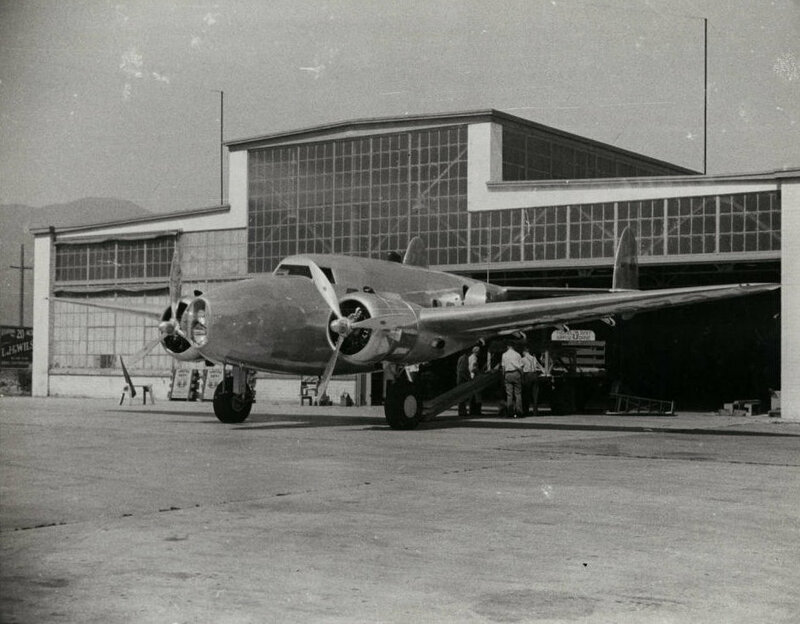 More than 13,000 DC-3s, both civil and military versions, U.S. and foreign built, were produced. Many are still flying. Dutch Kindelberger above and right in 1944 standing with the P-51 Mustang, the World War II fighter that gave the Allies air superiority over Germany. James Howard Kindelberger was born in Wheeling, West Virginia, in 1895, the son of a German-American steelworker. In 10th grade, he quit school and followed his father into the Wheeling steel mills--then immediately began plotting his escape. Working by day and studying at night, Dutch managed to pass the entrance exams to Carnegie Tech. From 1917 to 1918, he served as a World War I pilot. At the end of the war, Kindelberger was hired as a draftsman for the Glenn L. Martin Company--and found himself working under the country's foremost aviation expert, Donald Douglas. Forging a lifetime friendship with Donald Douglas, Kindelberger served as Vice President of Engineering at Douglas Aircraft--where he led the development of the DC-1 and DC-2. In 1934, North American Aviation asked him to take over as president--and Dutch rapidly built the company into one of the world' leading aircraft manufacturers. In the 1940s, North American Aviation produced two of the Second World War's most storied warplanes: the B-25 Mitchell bomber and the P-51 Mustang. Following the war, Dutch built America's first swept-wing jet fighter, the legendary F-86 Sabre Jet--which overwhelmingly defeated the Russian-built MIGs as they battled in the skies over Korea. 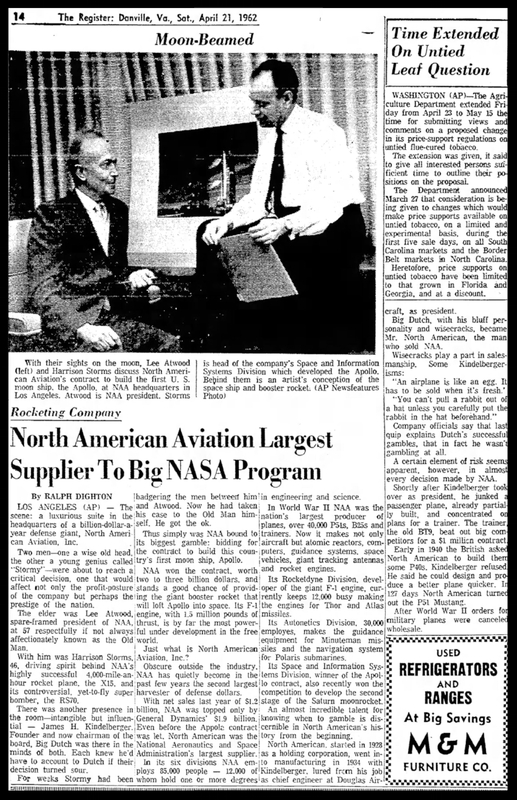 But it was Kindelberger's visionary foresight that distinguishes him as one of America's greatest aerospace pioneers. Reshaping his company's mission in the post-war era, Dutch pioneered U.S. rocket research in the 1950s. In 1958, North American Aviation rolled out the X-15 Rocket--the critical step between the domain of jet aviation and manned space flight. And in July 1969, under North American leadership, the Apollo Moon Landing was successfully achieved. North American Aviation plant production line in may 1939. "Kindelberger wrangled a $1 million order from the British for trainer aircraft. Derivatives of this would eventually be manufactured in the United States as the T-6 Texan, and in Britain as the Harvard, and be adopted by nearly every Air Force on earth. The British were so impressed with the Harvard that they signed a contract with Kindelberger to produce 320 new-design fighters. Kindelberger's team rolled out the prototype of the P-51 Mustang only three months later. It went on to become the most successful fighter aircraft in history, and the cornerstone of American aerial dominance in World War II. Schmued and Bowen, North American Aviation premiere engineers. Dutch with Lt. Colonel Jimmy Doolittle (above right) from Norm Avery book. Jmaes Howard "Dutch" Kindelberger second from left. Ken Bowen, far right. Ernie Breech second from left. Image- Norm Avery book. P-51 Mustang at Iwo Jima 1945. "Among one of the most famous fighters of World War II, the P-51 Mustang has its roots in both Britain and the USA. Originally overlooked by the USAAF, the P-51 did not see action with American forces until March 1943. 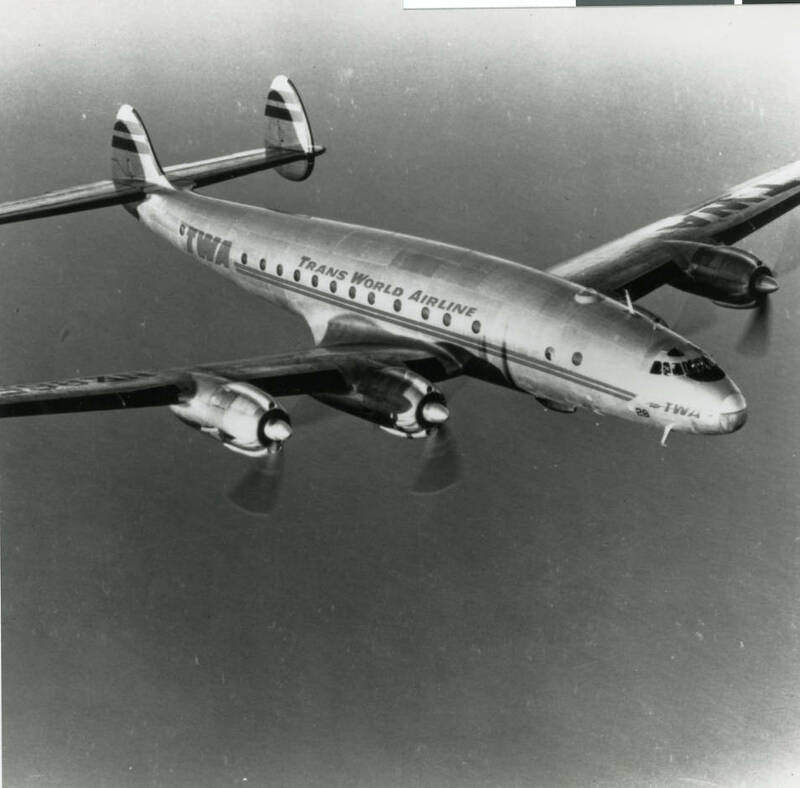 Once its full potential had been developed, the USA realized that this aircraft had been ignored for far too long a time. With the forging of the American airframe with the British Rolls-Royce Merlin engine, it would be unmatched by any other piston aircraft of World War II. " James H. “Dutch” Kindelberger, President of North American Aviation Inc.
James McDonnell above and left in the early 1960's personally overseeing every detail of the Mercury and Gemini Space Programs. James Smith McDonnell was born in 1899, in Little Rock, Arkansas, where he delivered copies of the Arkansas Gazette on horseback every morning before school. In 1917, he enrolled at Princeton University--and promptly traded his money for a winter coat for his first ride with a barnstormer in a rickety biplane. His passion for aviation was kindled at that moment. By 1925, McDonnell had earned a Masters Degree in aeronautical engineering from MIT and enlisted in the Army Air Service to learn how to fly. He was awarded his pilot's wings at Brooks Field, Texas, and was one of six volunteers to make the first airplane parachute jump--leaping off the wing of a DeHavilland biplane. By 1939, James McDonnell was ready to start his own company. Settling down in St. Louis, he founded McDonnell Aircraft on the 2nd floor of a building at Lambert Field. Surrounding himself with first-class engineers, McDonnell proceeded to develop a series of the finest jet fighters in the world--with names like Phantom, Voodoo, and Banshee. "By the mid-1960s, McDonnell Aircraft Corp. was the largest employer in Missouri, and in 1967, it expanded its operation by merging with the largest employer in California, the Douglas Aircraft Co.
James S. McDonnell took over as chairman and chief executive officer of the McDonnell Douglas Corp. In 1971, his nephew, Sanford N. McDonnell, became president, and James S. McDonnell was chairman of the board and chief executive officer. His nephew took over as CEO in 1972. James Smith McDonnell remained chairman of the board of directors until his death on Aug. 22, 1980. A veteran of ten years in professional theatre before he made his first film, William Winship has won numerous awards as a playwright and stage director on both sides of the Atlantic--staging plays in Seattle, Edinburgh, and London. As a playwright, he received the prestigious Stanley Kramer Award, and served artistic residencies both in the U.S. and in England--serving as Seattle Arts Commission "Artist-in-Residence" in Seattle, and as "Playwright-in-Residence" at the Trinity Theatre in Kent. Working as a documentary filmmaker, Winship was honored with a 2002 EMMY nomination as Writer/Director of the original 90-minute PBS documentary "PIONEERS IN AVIATION." Mr. Winship holds a Masters Degree in English Literature from the University of Washington - where he taught Freshman English for three years. Above- William Winship (Producer/Director/Writer/Editor), Larry Latimer (ALF President/ Webmaster), Joan Kindelberger Graham (Daughter of Dutch Kindelberger) and James Kindelberger Graham (Dutch's grandson). All attending the premier of Pioneers in Aviation- The Race to the Moon at the Seattle Museum of Flight in 2006. William Boeing initial partner was George Conrad Westervelt, 1879-1956, seen here as a cadet. "Aviation was still a mystery to most Americans when businessman William Boeing and U.S. Navy engineer George Conrad Westervelt began building airplanes. Working out of Boeing's boathouse in Seattle, Washington, the two men and an assistant completed a plane, called the B & W, in June 1916. The next month, Boeing officially formed the Pacific Aero Products Company, which later became the Boeing Airplane Company. When the U.S. Navy assigned Westervelt to the East Coast, Boeing hired Tsu Wong as his engineer. 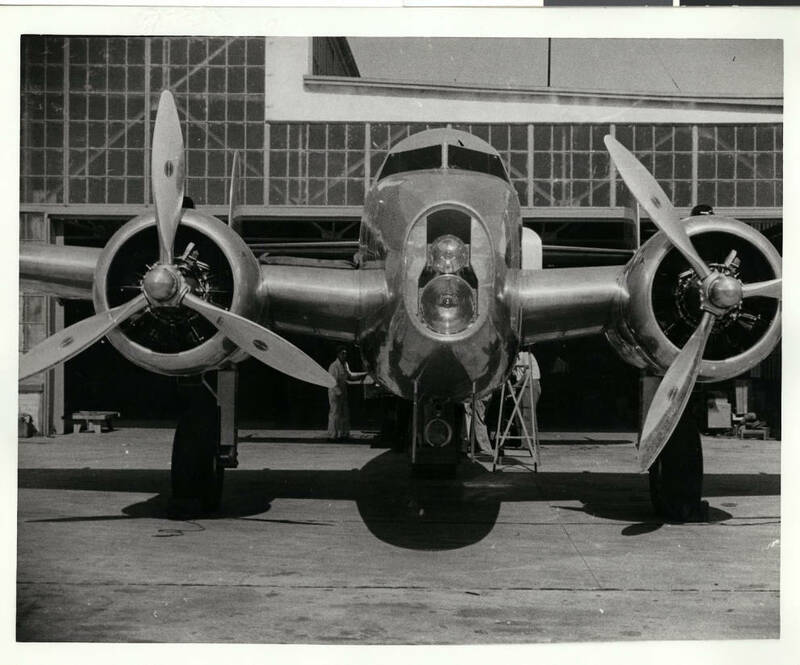 Wong's improvements to the B & W led to the Model C, Boeing's first commercial success. During World War I (1914-18), the company sold fifty Model C's to the U.S. government; its first international sale came when New Zealand bought two for its postal service. After the war, however, the demand for planes fell, and Boeing made furniture and small boats to stay in business. "It is 1961 and the Soviet Union has just launched the first man into space. President Kennedy responds by saying, "I believe that this nation should commit itself to achieving the goal, before this decade is out, of landing a man on the moon and returning him safely to Earth." US Air Force marks 65th anniversary of the legendary "Doolittle Raid"
Glenn Curtiss at the controls of a Curtiss aircraft. Currtiss was a well known motorcycle designer/builder also. "Before achieving fame in aeronautics, Glenn Curtiss started his career with motorcycles. The early aviation community began to seek out Curtiss because of his growing reputation for designing powerful, lightweight motorcycle engines. In 1906 he designed his first V-8 engine in response to several requests from early aeronautical experimenters." Smithsonian Air & Space. "Glenn H. Curtiss, a young entrepreneur from Hammondsport, N.Y., was someone who craved speed. Racing bicycles in the local area led to a passion to go faster and, eventually, he produced lightweight, powerful engines that garnered the attention of "Captain" Thomas Baldwin. Baldwin, a former trapeze artist turned aviator, created the "California Arrow"a dirigible that became the first aircraft to complete a circuitous flight in 1904. Between 1908 and 1910, Curtiss helped build a number of aircraft and set several early aviation records, including the first long-distance public flight from Albany to Governors Island in New York using the Curtiss "Hudson Flyer" May 29, 1910 - distance of 134 miles. Glenn Curtiss in his Biplane, July 4, 1908. Above- Glenn L. Martin in pusher-biplane. Note the newspapers stacked on wing. Martin delivered newspapers from Fresno to Madera as a part of his promotional efforts to fund first plant. Photo circa 1912? Repository: San Diego Air and Space Museum Archive. "12 April 1918: Allan and Malcolm Loughead, owners of the Loughead Aircraft Manufacturing Company of Santa Barbara, California, set speed and distance records as they flew their twin-engine, ten-place F-1 flying boat from Santa Barbara to San Diego. The F-1 traveled 211 miles in 3 hours, 1 minute. Designed by friend and employee John Knudson (“Jack”) Northrop, and built in a garage on State Street, the F-1 was launched on a wooden ramp at West Beach. Malcolm and [in cockpit] Allan Loughead in boots and Jack Northrop (left). Image- San Diego Air and Space. "The F-1 was powered by two right-hand tractor, water-cooled, normally-aspirated 909.22-cubic-inch-displacement (14.899 liters) Hall-Scott A-5-a single-overhead cam (SOHC) vertical inline six-cylinder engines with a compression ratio of 4.6:1. The A-5-a was a direct-drive engine. It was rated at 150 horsepower and produced 165 horsepower at 1,475 r.p.m. The engines were mounted on steel struts between the upper and lower wings. The engines turned two-bladed, fixed pitch propellers with a diameter of 8 feet, 8 inches ( meters) The Hall-Scott A-5-a was 5 feet, 2.5 inches (1.588 meters) long, 2 feet, inches (0.610 meters) wide and 3 feet, 7.875 inches (1.114 meters) high. It weighed 595 pounds (270 kilograms). P-38 Lightning. Image- The Flying Bulls. "The Air Force nearly achieved hypersonic flight half a century ago with the X-20 DynaSoar, the great might-have-been link between the Silverbird, the Space Shuttle and the SR-72. Designed to soar into space atop a Titan missile, orbit like a space capsule and land like a fighter plane, the X-20 fulfilled the Silverbird dream only to be killed off by Defense Secretary Robert McNamara. "Be Quick, Be Quiet, And Be On Time"
Clarence Leonard "Kelly" Johnson (February 27, 1910 – December 21, 1990) was an American aeronautical and systems engineer. He is recognized for his contributions to a series of important aircraft designs, most notably the Lockheed U-2 and SR-71 Blackbird. Besides the first production aircraft to exceed Mach 3, he also produced the first fighter capable of Mach 2, the United States' first operational jet fighter, as well as the first U.S. fighter to exceed 400 mph, and many other contributions to a large number of aircraft. As a member and first team leader of the Lockheed Skunk Works, Johnson worked for more than four decades and is said to have been an "organizing genius". He played a leading role in the design of over forty aircraft, including several honored with the prestigious Collier Trophy, acquiring a reputation as one of the most talented and prolific aircraft design engineers in the history of aviation. In 2003, as part of its commemoration of the 100th anniversary of the Wright Brothers' flight, Aviation Week & Space Technology ranked Johnson 8th on its list of the top 100 "most important, most interesting, and most influential people" in the first century of aerospace. 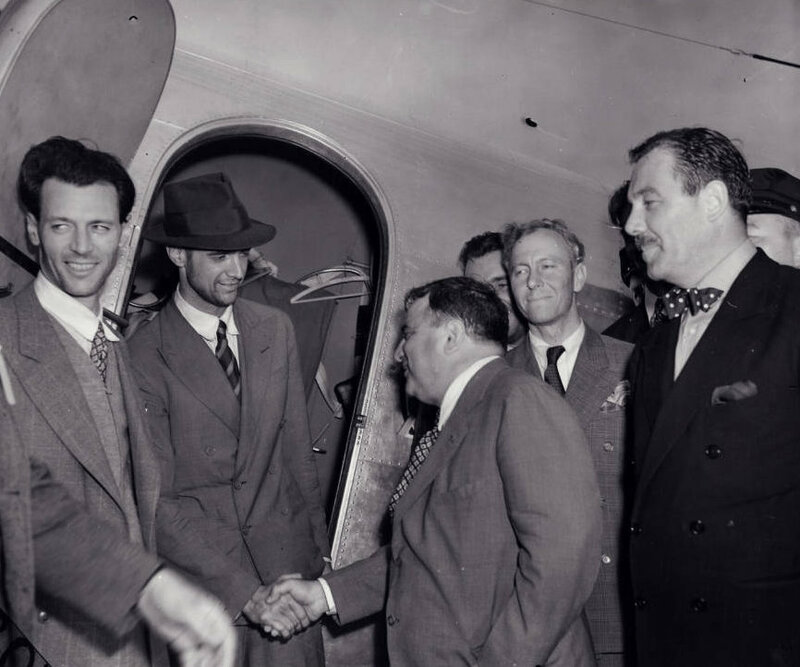 Hall Hibbard, Johnson's Lockheed boss, referring to Johnson's Swedish ancestry once remarked to Ben Rich: "That damned Swede can actually see air." Johnson has played a leading role in the design of 40 world renowned aircraft. Of these more than half were of his original design. Among them the F-80, America's first production jet; the double-sonic F-104 Starfighter; the high altitude U-2 and the spectacular 2,000 MPH YF-12A and the SR-71. Above- The SR-71 Blackbird is still the fastest plane that has ever flown and served an important role in history as a spy plane. Its first test flight was on December 22, 1964 and was never once hit by a missile during its 25 years of service.Though these awesome planes haven’t left the ground since before the turn of the century, they’re still worth all the recognition of being the fastest plane on Earth. "Hughes wasn't merely an eccentric billionaire, but a genuinely accomplished aviator. He won the 1934 All-American Air Meet in Miami with a speed record of 352 mph in the experimental military plane the "H-1". 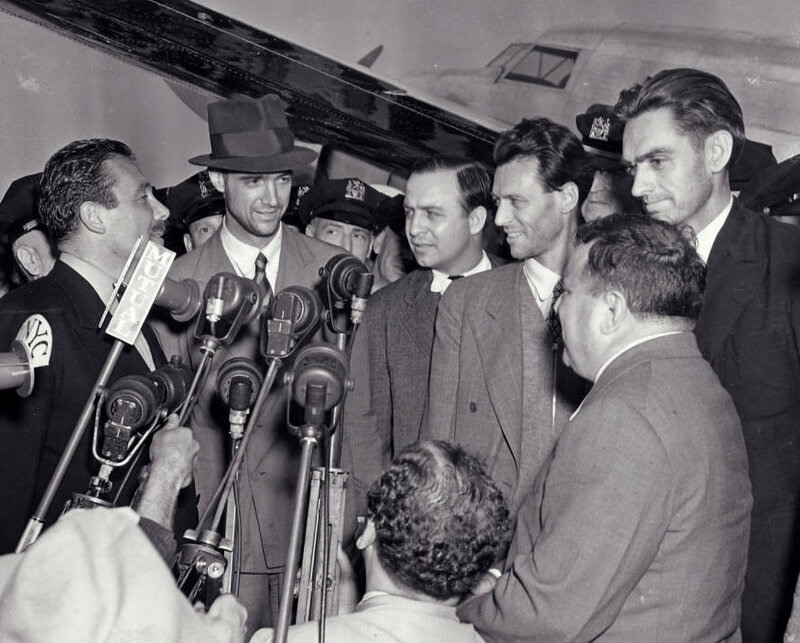 Hughes also piloted around the world in 1938 with a small crew, and broke Lindbergh's New York to Paris record in half with a time of 3 days, 19 hours, and 17 minutes. In 1932 Hughes formed Hughes Aircraft, which produced several inventions in aerospace technology. Howard was presented the Congressional Gold Medal in 1939 for his achievements in advancing science in aviation. Hughes XF11 plane 1946. 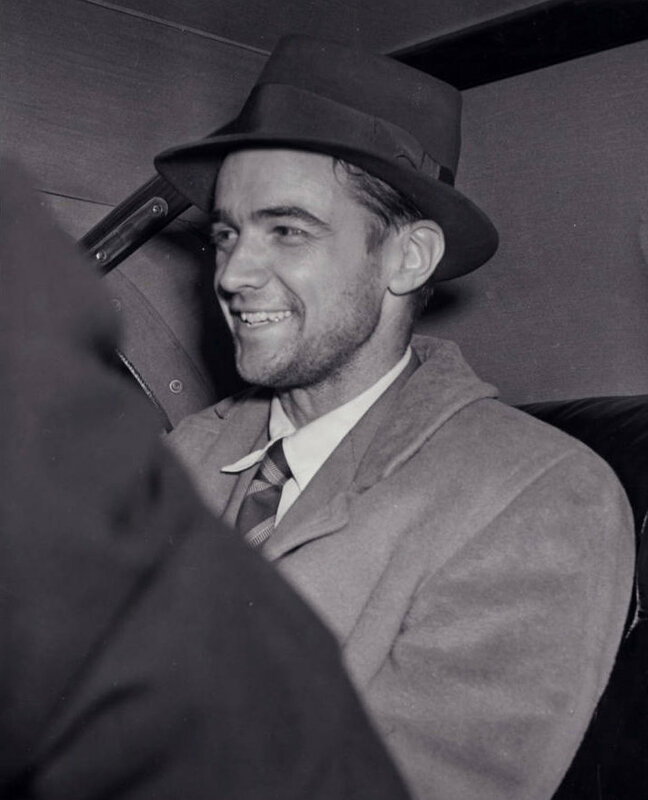 Howard hughes in the cockpit. Photograph courtesy of UNLV Special Collections. "The Hughes XF-11 was designed to be a fast, long-range reconnaissance aircraft for the U.S. Army. The XF-11 was twin-engine. twin-boom, all-metal monoplane with a pressurized cockpit and tricycle landing gear. The first prototype featured a pair of four-bladed contra-rotating propellers. This unusual design increased performance and stability but added a great deal of mechanical complexity. The Army originally ordered 100 XF-11's, but the order was canceled at the end of World War II, leaving Hughes with two prototypes. 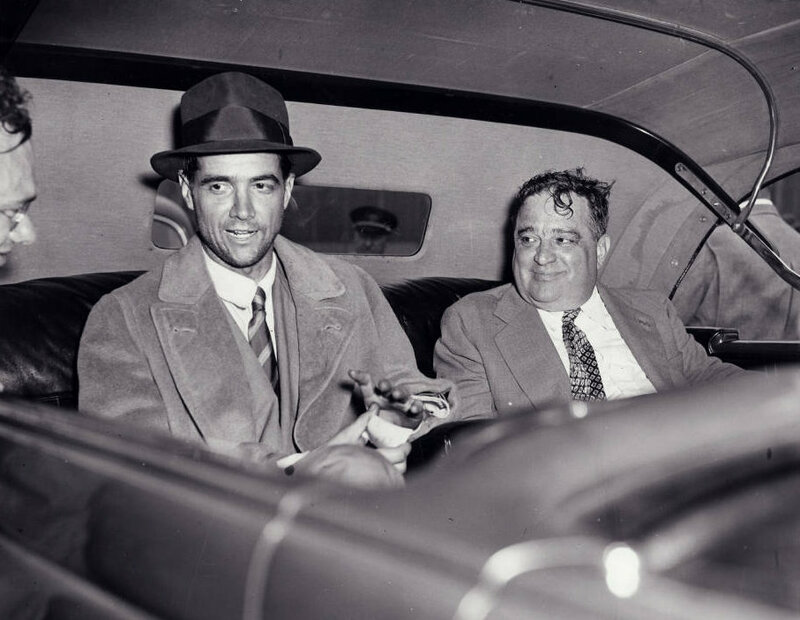 "Howard Hughes almost lost his life in the summer of 1946, when his XF-11 aircraft crashed in Beverly Hills. After grazing three homes, the plane crash landed and burst into flames, as Martin Scorsese so brilliantly recreated in The Aviator, above. Hughes, however, was ultimately saved by a man named William S. Durkin-- a US Marine who pulled the aviator away from the wreckage and brought him to safety. Hughes apparently offered Durkin a monetary reward in the wake of the crash, but, according to Durkin's daughter, was spurned on several occasions. He did, however, send a heartfelt letter of appreciation, which Letters of Note published last year. Below is an excerpt, dated December 23, 1946." 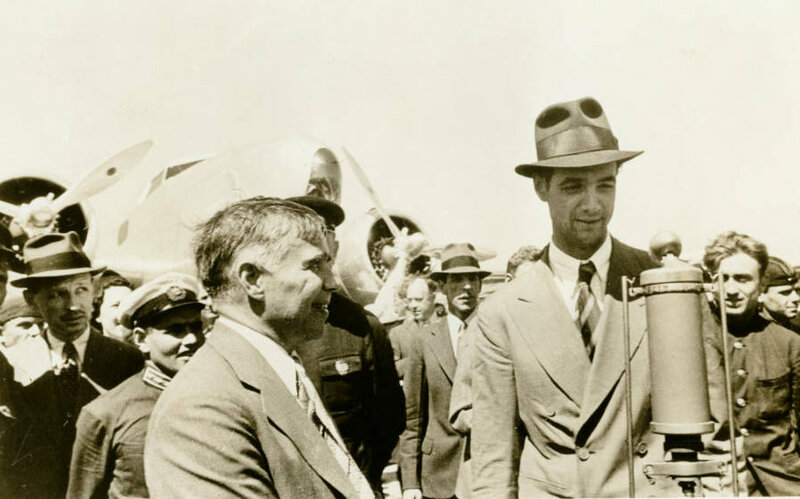 Above- Howard Robard Hughes, Jr. (December 24, 1905 – April 5, 1976) was an American business tycoon, investor, aviator, aerospace engineer, inventor, filmmaker and philanthropist. During his lifetime, he was known as one of the self-made wealthiest people in the world. 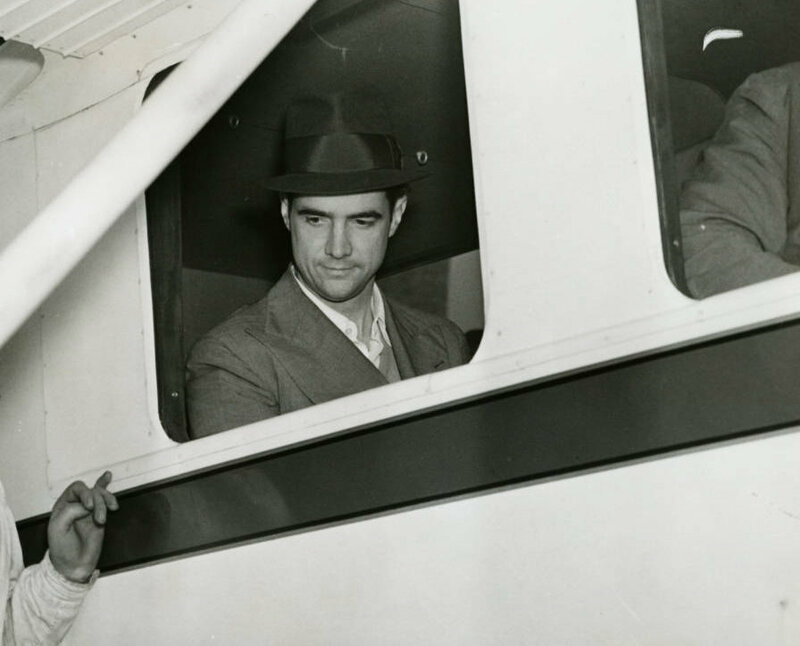 Above- Portrait of Howard Hughes, without a mustache, Oct. 11, 1956. Above- Photograph of Howard Hughes demonstrating a radar safety device May 1 1947. Dr. Harrison Storms and Dr. Wernher von Braun. Rollout day for X-15 No. 2 27 Feb. 1959. Below Newsreel - Charles Lindbergh...." wanted his new plane to be able to make a nonstop flight across the United States, as well as scout new air routes to China. It was up to Lockheed to invent the technology to meet his needs. Lindbergh’s list of custom touches included a tandem cockpit with dual controls and sliding canopy to accommodate him and his co-pilot—his seven-month’s-pregnant wife, Anne Morrow Lindbergh. The fuselage needed to be big enough to allow for full use of parachutes in case they needed to make a mid-air exit. Room also had to be made for state-of-the-art navigation equipment and a small generator that could power the Lindberghs’ electrically warmed flight suits. Lockheed chief engineer Gerard Vultee designed the Lockheed 8 Sirius based on Lindbergh’s specifications. Slightly smaller than the Spirit of St. Louis—just shy of 43 feet to the St. Louis’s 46—the Sirius was capable of traveling 185 miles per hour compared to the St. Louis’s top speed of 133 mph. It was delivered in April 1930, and within days Charles and Anne embarked from Los Angeles, arriving in New York City 14 hours, 45 minutes, and 32 seconds later—breaking the previous record by 3 hours". 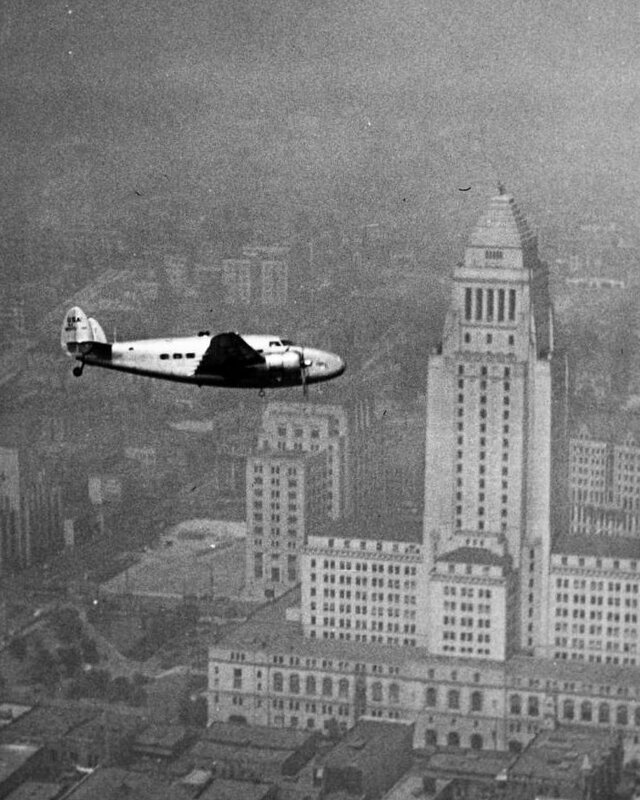 Above- This short, silent newsreel shows Charles Lindbergh and his new wife Anne Morrow Lindbergh arriving in Los Angeles by biplane. The purpose of this trip was to pick up their new Sirius monoplane, which they would then fly back to New York. 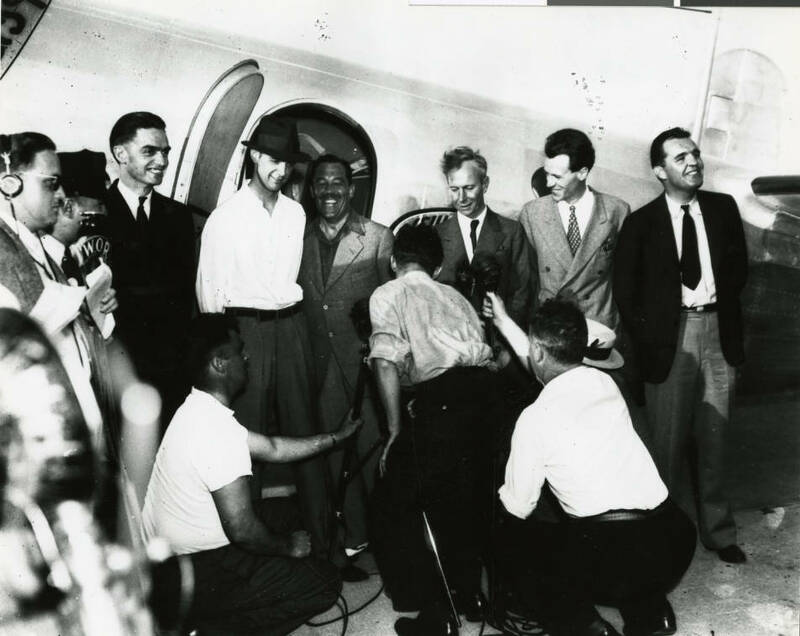 Lindbergh became the first true global celebrity—and sparked a worldwide craze for flying—with his 1927 nonstop solo flight from New York to Paris in the custom-built Spirit of St. Louis. 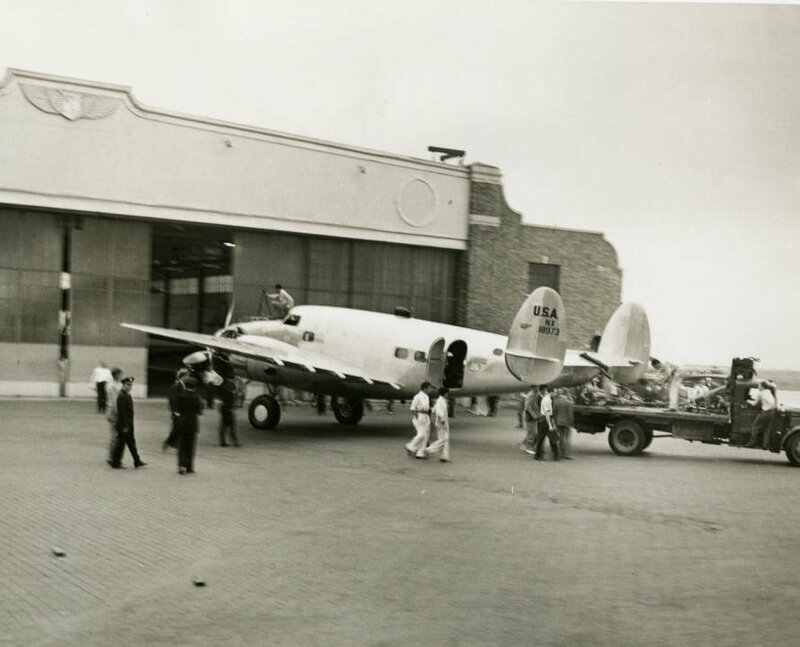 With that plane donated to the Smithsonian Institution the following year, and with Lucky Lindy’s de-facto role as the global ambassador for aviation expanding by the month, he needed a new, more versatile plane to suit his expanding horizons. He turned to Lockheed which was already known as an innovative designer and manufacturer of some of the world’s finest and fastest aircraft. Charles A. Lindbergh and Anne Morrow Lindbergh with their Lockheed Sirius airplane. 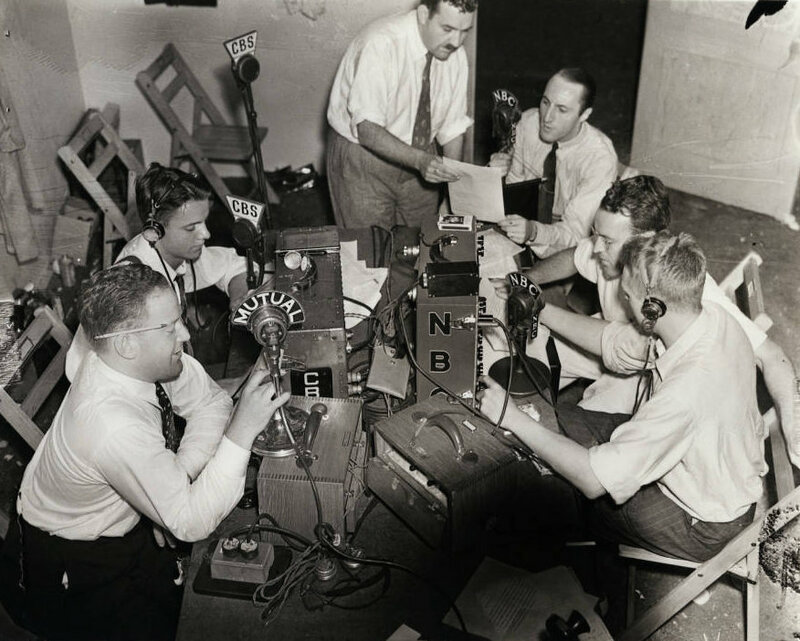 Jerry Vultee far right. Charles A. Lindbergh and Anne Morrow Lindbergh with their Lockheed Sirius airplane.